Ideal for supporting funnels, round-bottom flasks, reaction vessels, and other apparatuses requiring lower support. 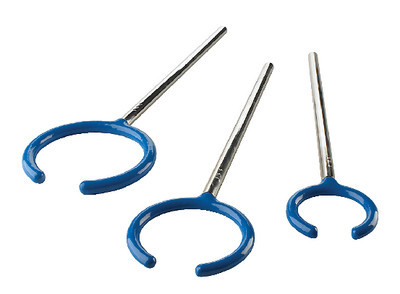 These PVC-coated aluminum rings feature an opening that allows simple removal of sample containers. The long extension arm permits depth adjustment of the open ring from the lab frame or ring stand. PVC coating protects glassware.